This page was supposed to take me 1 day to finish, took three, haha. Going down in history as one of the more painful comic deliveries. And, because it’s come up in the comments a few times this chapter, I’ve posted a new Meek post about eye color variation for those who were wondering about that. Lots of other stuff going on, esp for tutorial-enjoyers and Patrons. Patrons– A new tutorial about proportions in comics is up now! The worksheet will be up later today. For non-Patrons, an unlocked tutorial about branding your work was recently posted to my Tumblr, so you can read that for free if you like. ECCC was earlier in the month, I had a great time meeting many of you guys :] So nice to preview the lovely Volume 1 book and get a few into the hands of people who missed the Kickstarter. For Kickstarter backers, the books will be going out probably at the end of this month or very beginning of next… the boat is set to arrive into port tomorrow so I’m really excited. 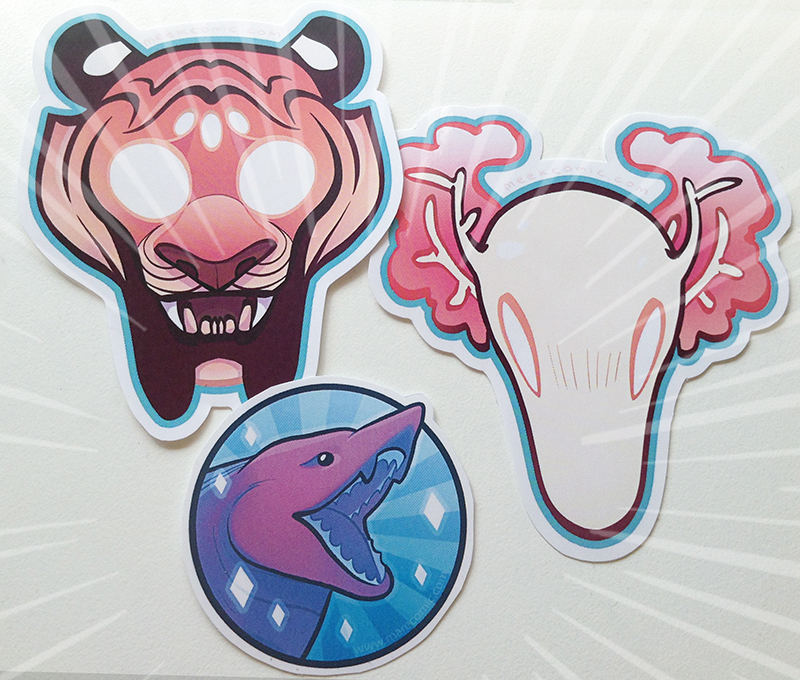 If you missed ECCC, I had a few stickers and such for sale and giveaway! Any $5+ Patrons can enter the Patreon sticker giveaway contest to nab some stickers shown below~ There will be several winners so go ahead and comment on eligible posts any time this month to enter. The look of a man about to lose his job or possibly his life. I agree. The dismayed face and lowercase “aaaaaa” of panel three are pretty great. Poor Hyla, having to ‘hey’ for attention from her dad after a epic tackle!! Pay attention please Dad!! Is Luca afraid he’s going to roast someone by *accident*? Yeah, I get that impression too. Which, if true, makes the surprise tacklehug an absolutely terrifying prospect. Luca doesn’t strike me as someone who’s comfortable around children. I bet if he touches her, it’ll be to pet her awkwardly on the head like she’s a dog. The man puffed his chest out, and Lucas looked at it rather skeptically, lol. Maybe he’s making sure the servant is properly buttoned up – not one button in the wrong slot! I’m guessing if Lucas snarls at Hyla, he won’t win the “Best Dad in the World” mug, lol. Haha, they’re actually looking at Hyla running up the hallway XD I suspect that will read a bit more logically when there isn’t several weeks gap between this page and the previous one. If I had to hazard a guess, that expands out to Attendant Var, referring to guy in the red vest. This is correct. The words came out garbled because The Meek is a fictional narrative that exists only within the cave ecosystem in Mare Internvm, and you have only been there for two cycles, so the translation is still a bit finicky. Ah, that makes sense. I thought it was cursing. According to the wiki, “atda” means “what” so I’d guess he’s saying something like “what the hell” or “what’s going on” or “what is this” maybe? I love the art as always, but I’m having a hard time understanding what is happening on this page. I really don’t know. I hope my feedback is helpful. I’m having the same issue. This page just isn’t reading very clearly to me. I think panel 2 would be better if we could see more of Hyla actually making contact with her father at the moment of hug/tackle. Panel 3 onward confuses me too. Took me a few times reading to figure this one out. I actually have to third this sentiment, this page is really confusing for some reason; I can’t really put my finger on WHY, though. It just took me a couple reads to get a grip on what was happening. I agree, this page isn’t as smooth as the others and has an odd super-manic tone. Everything seems to be happening between the panels or behind the panel borders. It’s as if our usual cameraman is replaced by some random amateur who immediately zooms in too close. Security detail tightened after this lol. I keep reading this page but I’m not really sure what happened. Could someone narrate it for me? Ohhhh. He’s throwing her under the *bus*. I had trouble working out what he believed Bo Tesca was – “resting”? But I now see the fourth letter is a partially covered “p”, presumably for “responsible”. Hyla appears to have quite the tackle. She actually succeeded in bringing her stocky father to one knee. Unless Luca is weaker than he looks right now. I suspect it’s a lot more difficult to keep a stable stance with just one leg. Totally forgot that he’s an amputee. Derp. I hadn’t even thought about the contrast between the paranoid, cold-hearted, homicidal old man; and his young, wide-eyed, innocent daughter. But now that I think about it, this first encounter between them is compelling because it could mean everything. Luca could brush her off and show that he’s lost all spark of decency, he could embrace her and show some possibility of redemption, or anything in between. I’m really looking forward to seeing how this plays out on the next page. Given that Luca’s first thought after being tacklehugged by his youngest is authoritarian – “why is she not where the rules require” – and then is so focused on yelling at a servant that he doesn’t notice she’s right there – “go after her because I don’t see her right there” – he’s never been particularly fond of her. But realizing that she loves him, and that she’s the only person left who does, he might take her to his heart. She’s probably his only chance to regain some humanity. I think “Go get her” refers to the nanny that the steward is looking to blame, not Hyla. Oh, that is a possbility… It’s not clear who Luca means, which is reasonable confusion. That would make this scene even sadder: he’s not even asking that his daughter be brought to him, he’s calling for the “tool” used to control her. Poor child, her mother was probably the only person who gave her unconditional love. Sooo, you posted the eye color variation explanation on Patreon for $5+ patrons to ensure only people commenting it here would now be the ones who don’t pay? Tricky. I’m confused by panel 4- it seems like Hyla teleported. 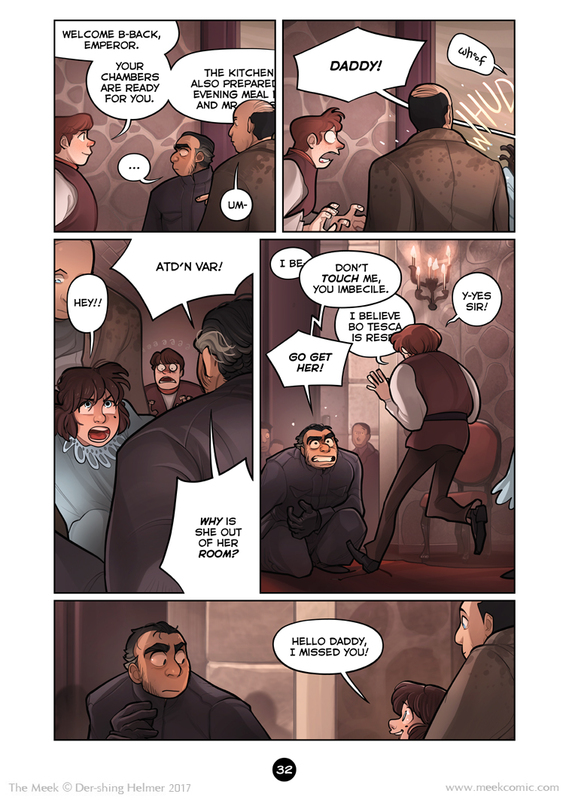 In panels 3 and 5, she is standing directly between Uli and Luca, but in panel 4, she is behind Var, about 10 feet away, and seemingly running *away* from all 3 of them. It’s a combination of changes in perspective and the fact that in panels 3 and onwards, Uli is dragging her off Luca and pulls her back down the hall the way she came. I am interested to see what happens in the next scene. I had thought that Luca was a loving father before all this started. A little paranoid, but it had seemed like he truly loved his wife and kids. Silence: You’re Doing It Wrong. There is no force in the multiverse capable of containing precocious and eager children.